When you buy your new Jaguar, you will have the peace-of-mind that comes with purchasing a quality vehicle. Even better, you will get the Jaguar EliteCare advantage too. Every new Jaguar now comes with this amazing ownership package which includes a best-in-class 5-year / 60,000-mile warranty. In addition, you will receive complimentary scheduled maintenance and complimentary roadside assistance. Plus you get the innovative Jaguar InControl™ technology. 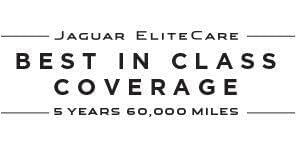 Visit Jaguar Colorado Springs today and let us tell you more about the many advantages of Jaguar EliteCare! Then let us show you our impressive selection of the innovative, stylish 2017 and 2018 Jaguar vehicles. Take a test drive and try out the many features of your favorite Jaguar!